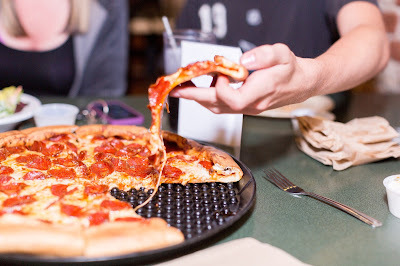 Woodstock Pizza Customer Appreciation Month - San Diego Dining Dish! El Cajon Boulevard’s Woodstock’s Pizza has dubbed the month of July as Customer Appreciation Month and is rolling out some saucy deals and events to celebrate their loyal pizza enthusiasts. The best part? The whole family can join in on the festivities! From kid-themed trivia nights to All Star Game viewing parties to beer pairing dinners, you won’t want to miss these lineups of events all July long. Be sure to keep an eye on the Facebook page, we’ll make a post announcing all the details & the first 40 people to respond get entry! Thu, 7/7 – Locals Pint Night w/ Stone Brewing Tap Takeover! Stop in to grub and just mention this to earn double the frequent woody points you earn on your order! Thu, 7/21 – Local Pint Night w/ Pizza Pairing, featuring Hess Brewing! Come in 5-7 PM, purchase any Hess Beer & get a specially paired pizza sample for Free! Super Smash Brothers Tournament on the Patio at 8 PM!! Sat, 7/30 – Taste of Woodstock’s! It’s about to be a tasty evening of food and drinks! Entry includes a flight of beer, and 5 paired food items, plus learn a little about the brews you choose. Tickets are $15, purchase here.